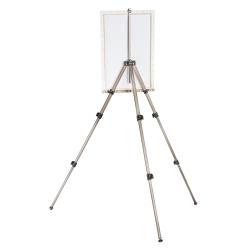 Sturdy and reliable, but nevertheless light as a fly weight: Our Easel from walimex convinces by its stability and easy operation. 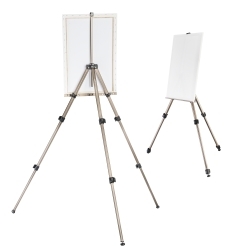 As hobby painter you will enjoy it very much! 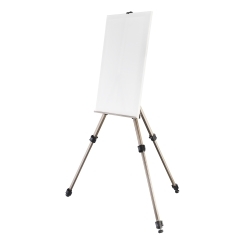 Whether in studio or in nature, the Basic Easel has a sturdy stand on every underground. This is the result of the convenient rubber feets, which are flexible in every position as well as the spikes, which provide stability on soft grounds, e.g. on grassland and in the forest. 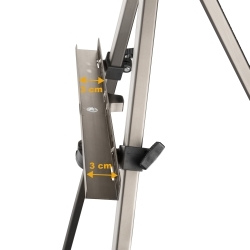 The height of the Easel can be adjusted easily and quickly through the quick-release fasteners. A carrying bag completes the whole on a charming way.